Lawmakers voted on a new proposal Tuesday that would clean up the streets of San Francisco. The spending plan comes after NBC Bay Area's Investigative Unit exposed potentially dangerous conditions in downtown San Francisco. The report went viral, grabbing headlines across the country. And the problem is now a major issues in the race for San Francisco's next mayor. Investigative Reporter Bigad Shaban continues to follow this story and reports in a video that first aired on April 10, 2018. The San Francisco’s Board of Supervisors narrowly passed a measure to spend $1.1 million to provide additional street and sidewalk cleaning across the city. The money, left over from last year’s budget, would be used to pay for additional street sweepers, cleaning equipment, and community grants to fund nonprofit organizations focused on cleaning San Francisco. Supervisor Jane Kim has been working to pass a measure that would release city funds immediately for cleaning the streets. She initially asked for $2.5 million in revenue left over from last year’s budget, but at Tuesday’s Board of Supervisors weekly meeting she scaled back her proposal down to $1.1 million. The proposal passed in a 6-5 vote. Supervisors Kim, London Breed, Sandra Lee Fewer, Aaron Peskin, Hilary Ronen and Norman Yee voted in support. Supervisors Malia Cohen, Catherine Stefani, Ahsha Safai, Jeff Sheehy, and Katy Tang voted against the measure. The San Francisco Board of Supervisors narrowly passed a measure Tuesday by 6 votes to 5 – to adopt a proposal to use leftover money from last year’s budget for street cleaning. The proposal fell two votes short of receiving enough support to remain “veto-proof.” Unless Kim can convince two additional supervisors to back the proposal when it comes up for a second vote at next week’s board meeting, Mayor Mark Farrell tells the Investigative Unit he will veto the measure and promised to unveil his own “much more comprehensive” proposal in the coming weeks as part of next year’s budget. “I don’t see why we can’t wait for, literally, a month or two,” said Supervisor Katy Tang, who voiced opposition to Kim’s proposal since it aims to bypass the normal budget approval process that is scheduled to get underway over the next two months. Such a move would “circumvent the budget process,” said Supervisor Malia Cohen, chair of the board’s budget committee. “That’s kind of a haphazard, piecemeal approach to how we are dealing with our budget process." Cohen said bypassing the standard budget hearing process should only be reserved “to address emergency problems, immediately.” Cohen voiced similar criticism during the board’s budget committee hearing last month, which voted to toss out Kim’s proposal. Kim, however, argued the issue is a “public health crisis” and, thus, requires immediate action. In a rare move, Kim sidestepped the committee and had her proposal heard before the full board Tuesday by obtaining the support of three other supervisors: Peskin, Ronen and Fewer. “[Residents] understand there’s a budget process, but they don’t want to wait months for these services,” Kim said during Tuesday’s hearing. “They want to see that funding today – as quickly as we can provide it." 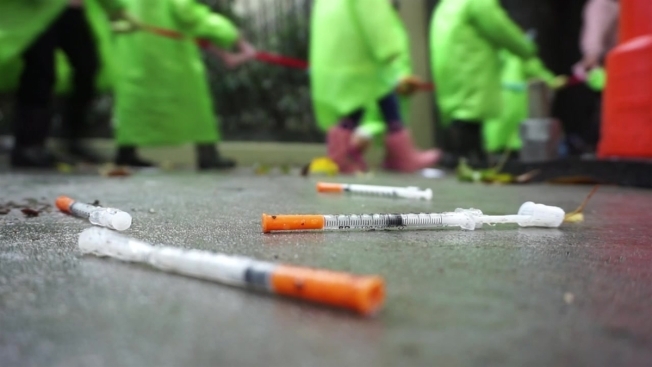 The spending plan comes on the heels of an NBC Bay Area investigation that exposed a potentially dangerous mix of trash, feces, and used needles scattered throughout the streets and sidewalks of downtown San Francisco. The report went viral and the city's dirty streets are now a main issue in the race for San Francisco's next mayor. The proposal originally called for $2.5 million in additional street cleaning through the end of the fiscal year; however, Kim reduced that amount to $1.1 million on Tuesday since less than three months remain before the start of the next fiscal year and corresponding budget cycle. NBC Bay Area’s Investigative Unit reported on San Francisco’s dirty streets in February – after surveying 153 downtown streets and finding over 300 piles of feces, 100 needles and trash on every single block. Two new street sweeping machines at $280,000 each. $230,000 to fund TL Clean, a community group that picks up trash in the Tenderloin. The extra money would allow the group to ramp up operations from 5 days a week to 7. $100,000 for cleaning materials and supplies: brooms, shovels, pickers, bags, uniforms and protective equipment. Late Tuesday, following the board vote, Farrell vowed to nix the proposal, saying it comes “in the middle” of the budget cycle. The San Francisco’s Board of Supervisors narrowly passed a measure to spend $1.1 million to provide additional street and sidewalk cleaning across the city. The money, left over from last year’s budget, would be used to hire street sweepers, purchase additional cleaning equipment, and fund non-profit organizations focused on cleaning San Francisco. “It’s just not okay to have to step over human feces – or dumping of litter on the ground, when we know that with additional resources and with additional manual street sweepers we can address this problem today,” said Supervisor Jane Kim, who authored the plan. The proposal passed in a six to five vote. Supervisors Aaron Peskin, Norman Yee, Hillary Ronen, Sandra Fewer,Jane Kim and London Breed voted in support. Supervisors Cohen, Stefani, Sheehy, Tang and Safai voted against the measure. Since the proposal fell two votes short of receiving enough support to remain “veto-proof,” Mayor Mark Farrell could potentially nix the plan. Unless Kim can convince two additional supervisors to support the proposal when it comes up for a second vote at next week’s board meeting, Farrell tells the Investigative Unit he will veto the plan, promising a more “comprehensive” proposal that he promises to unveil in the coming weeks as part of next year’s budget. “I don’t see why we can’t wait for, literally, a month or two,” said Supervisor Katy Tang said during Tuesday’s board meeting. Maliah Cohen, who chairs the board’s budget committee, also voiced concerns in allowing Kim’s proposal to bypass the standard budget hearing process. “That’s kind of a haphazard, piecemeal approach to how we are dealing with our budget process ,” she said. Cohen voiced similar criticism during the board’s budget committee hearing last month, which voted to toss out Kim’s proposal. Kim, however, argued the issue is a “public health crisis” and, thus, requires immediate action. In a rare move, Kim bypassed the committee and had her proposal heard before the full board Tuesday by obtaining the support of three other supervisors: Aaron Peskin, Hillary Ronen, and Sandra Fewer. Two new street sweeping machines - at $280,000 each. Farrell vows to nix the proposal, saying it comes “in the middle” of the budget cycle.